Born in Belfast, Paul began his writing career as a playwright before moving to London where he wrote comedy shows, which were performed at the Edinburgh Festival and in London's West End. His short stories have been published in literary journals and anthologies. The Good Son is his first novel. Poignant, insightful, funny, compelling - beautiful. Wonderful characters, voice and tension that make The Good Son completely gripping from the first page. Beautifully written and powerfully plotted - a stunning first novel. A wonderful book - my book group really enjoyed it. The characters drew you in. Flawed and vulnerable with hardened exteriors so reminiscent of my own Northern Irish Catholic family. It's too good not to win. A touching, affectionate and gritty read. I enjoyed it immensely. A humane and intelligent book, about a working class lad growing up in a dysfunctional family in Belfast in the time of the Troubles. A very compelling read. An uplifting coming-of-age story and a great read! From the opening page of Paul McVeigh’s debut novel The Good Son, I cared deeply about his central character Mickey Donnelly, frequently forgetting Mickey was fictitious. I was so engaged I kept wondering how I could help this bright, intelligent, yet innocent child as he clumsily negotiated the path of a young gay boy growing up in a dysfunctional working class family in Belfast during the time of the Troubles. Mickey’s stoic resilience, humour, and naivety, coupled with his innate emotional intelligence made me laugh and made me cry. 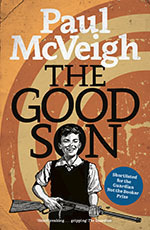 But McVeigh’s novel is much more than the story of an intelligent but lonely young boy. Its political backdrop provides an excellent social commentary on life in Northern Ireland during the time of the Troubles. A fantastic story told from the point of view of young Mickey growing up in The Troubles. You feel the tension and you get to know the very heart of him. Great comic moments as well as heart wrenching tragedy. I pondered this novel for days after finishing--and during the reading process. "The Good Son" in the book struggled on many levels, being pulled in many different directions. He would discover information only to find it led to more secrets and unknowns that he really did need to know -- but did he want to? Always, the fretting about consequences with knowing the bad with the good. The ongoing tension caused me to care for the community, not just the characters. I LOVED this book. Beautifully written with a warm heart. This is a wonderful coming-of-age book that manages to mesh a vivid portrayal of a child's inner world with the complex political situation that colours his every experience. Phenomenal debut novel. A quirky, charming book with a great deal of sadness written into the prose. It has the perfect balance of comedy and trauma. tremendous story driven by ripping dialogue and believable characters. Its a gutsy instinctive tale of its time and place. It's set in Belfast during the Troubles - but there is much that will ring true today for many communities worldwide. By the end of the book you will have taken Mickey's tale personally and be absolutely running down the streets with him.